Do you always dread the arrival of the time of year when you have to submit your car for its annual MoT test? Of course, you are far from alone - in both 2011/12 and 2012/13, around 28.5 million vehicles passed through an authorised test centre. For starters, you know you’re going to have to pay as much as £55*, just to have your pride and joy looked at. And after half an hour or so, you could well find yourself being handed a feared record sheet showing the reasons why your car hasn’t met the required standards to be issued with a new MoT test certificate - which means that, technically, it’s illegal to drive it. According to the Driver and Vehicle Standards Agency, the official government body in the UK which administers the MoT testing system, about one in four vehicles fails the test initially. Yet according to UKMOT.com, nearly a third of failure items listed fall into the category of lights. Yet, as this independent website points out, “the biggest reason for failure was lighting. A blown bulb! How hard is it to change a bulb?” In case you’re wondering, it’s a five-minute job in many cases, and all the instructions can be found in your car’s manual. Finding out figures for the most expensive or complicated reasons for a car to fail its MoT test is a little more difficult. That’s because, once a vehicle has been issued with a failure notification, there can be multiple reasons for this, and there is no official breakdown of such instances - the DVSA simply collects data on the various reasons listed on all the failure notices issued. However, of more than 800,000 failure notifications on which it collected data, nearly one in eight fell into the category of steering and suspension - or the category of the test in which faults are likely to take the longest and cost the most to fix. But there are also circumstances in which a failed light - in many cases one of the simplest and cheapest fixes - could, in fact, be a costly item to get put right. Take the case of a contributor to the chat forum on Cliosport.net, who recounted the tale of having to pay £291 - and this was in 2007, so the cost can only have risen since - for the supply and fitting of a replacement xenon headlight unit. When it comes to those steering and suspension faults, the most obvious sign that something is wrong is often a prematurely worn tyre. And if you then simply get this replaced, you could well be attending to a symptom, and not the main problem itself. garage work needed to satisfy the tester that the car is safe to be driven on the road. An extra point which needs to be made here is that the odds of the cost of an MoT failure being higher than you might expect are likely to be considerably greater if you don’t have your car serviced and checked regularly, and simply rely on the test itself to pinpoint failures and potentially dangerous faults. This is because, when you submit your car for the test and it then fails, you may well have no idea how long the fault(s) have been present, and what other problems might have arisen as a direct consequence of that original defect. Bodywork problems are a case in point here. A damaged body panel is an obvious sign that something is wrong with the car - but that panel is also there to cover and protect other parts of its internal workings. So if it is damaged, there’s a real chance that some of the mechanics beneath have also been affected, and will need attention before the car can be given a pass. In which case, you could be facing two separate sets of repairs - bodywork and mechanical - bringing the likelihood that your finances will be reeling from such a double whammy. 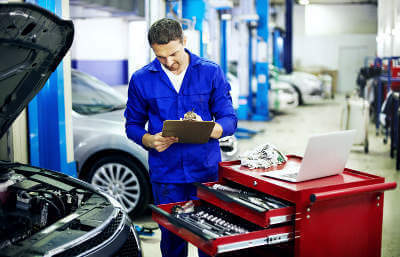 To help prevent you from falling foul of what could be an expensive MoT failure, UKMOT.com has also suggested a list of 20 areas on your car which should be checked over before you enter it for the test. That way, at least you’re minimising your chances of being one of the nearly four out of ten drivers whose vehicle fails the test when it is initially submitted. The windscreen and internal and external mirrors. And most importantly of all, checking all of these items should only take 15 minutes or so of your time. When you set this against the time and trouble you might have to sacrifice if any of these are marked on your fail sheet and you then have to get them put right before you’re allowed to drive again, is sparing that modest amount of time too much to ask? * The official MoT test price is set by the Driver and Vehicle Standards Agency, the body which administers the testing system, is £54.85 as at January 2016. Many testing stations, of course, offer the test for a lower price than this.